The Geese of Beaver Bog is a wonderful book. 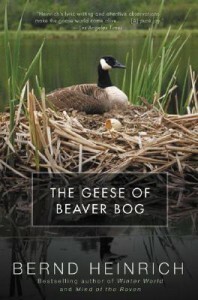 It's a several-years-in-the-lives account of the title's geese as well as the bog's other inhabitants. The author, Bernd Heinrich, is a professor of biology but this isn't a formal study of goose social lives. It's just a chronicle of the observations he made of the animals living in the ponds around his Vermont home. The main part is science light, though Heinrich appends a few, brief essays and a bibliography that discuss theory and direct readers to more "scientific" literature. And the bog contains quite a collection of individuals. The "Summer of Love" never ended here as Heinrich witnesses mate-swapping and sybaritic promiscuity that would have Focus on the Family howling with dismay. But he also witnesses the adoption of stray goslings and the care parents take to make sure their children survive. Heinrich establishes quite close friendships with four geese in particular: Peep, Pop, Jane and Harry (the wife-swapping pairs mentioned above), and he observes behaviors that aren't in the "geese textbooks" but reveal these birds as intelligent, feeling creatures who are not wholly governed by genetic programming but are independent actors. One of the more interesting behaviors was a migration of parents and young from Heinrich's bog to a smaller pond a couple of miles away (which occurred every year that the author observed the geese). At first glance, it would appear insane to cross two miles of predator-infested woodland (including a manmade road) trailing days-old goslings. Heinrich reasons that, in part, the more open landscape of the second pond afforded a more comfortable environment for the geese, who evolved in tundra-like conditions. The manifest dangers were less of a cost than the benefit of the psychological comfort afforded by a wide open, defensible pond (a good bet on the geese's part since in both migrations observed, the entire families made it intact). It's a human tendency to overgeneralize so that we speak of "the black community" or "evangelicals" or "the American people" as if these were real groups, all of one mind and body. Yet, when one flies closer to the ground, all the peaks and valleys, forests, and rivers come into sharp focus. That's one of the most attractive features of this book. By flying so close to the ground, Heinrich and his readers come to see the geese for the individuals they are. 1. Every creature has the right to life but that right is circumscribed by the ecosystem's right to survive. 2. No species has the right to so overwhelm its ecosystem as to cause the extinction of another, and that includes humans and their, so far, unchecked intrusions into every biota on the planet. Even if you don't agree with Heinrich's philosophy, it's undeniable that animals are highly complex creatures with lives nearly as involved as humans' (certainly among the mammals, fish and reptiles), and have roles in a healthy environment crucial to everyone's survival. It would behoove the reader to keep that in mind when considering the quality of our future here on Earth.